Tedd Arnold is the bestselling author and illustrator of the Fly Guy, Green Wilma, Parts, and Huggly series, and the illustrator of Detective Blue. He has received Theodor Seuss Geisel Honors for Hi! 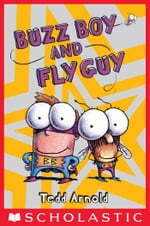 Fly Guy and I Spy Fly Guy! Tedd lives with his wife, Carol, in Florida. A fly was flying. He was looking for something to eat. Something tasty. Something slimy. A boy was walking. He was looking for something to catch. Something smart. Something for The Amazing Pet Show.